Snow Molds: Snow molds are not nearly as big of a problem in Virginia lawns as they are further north. However, when they occur, they certainly attract a lot of attention. 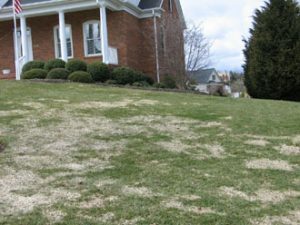 Following winters with extended snowfall, it is possible that cool-season lawn grasses have been attacked by either pink or gray snow mold. The blighted turf will be a circular patch of varying size of matted down turf. The diseases are more likely to occur on succulent turfgrass leaves that received very high levels of fall Nitrogen fertilization; so again, proper fall fertilizer is key. It is not generally recommended that home lawns be treated for snow molds because the disease is rarely going to kill turf in this setting. Use a heavy garden rake to work up the matted turf in the affected areas in order to increase air and moisture movement into the turf canopy. Observe the area over the next 7 days or so to see if new shoots are emerging from the crowns. If you don’t see any signs of new growth after that time period, then plan on reseeding these areas. Red Thread or Pink Patch: Spring-like temperatures and plenty of moisture result in ideal conditions for turfgrass diseases to make an appearance in lawns, particularly cool-season grasses. The disease present is likely one of two things: Red thread or Pink patch. The bright red to pink mycelial growth of this fungus is plainly visible early in the morning, particularly when the dew is still on the grass. The disease will remain an eyesore as long as cool, moist periods persist, but the fungus only attacks the foliage and rarely will the entire plant die. What should you do to manage this disease? Almost always, the proper treatment is to leave it alone rather than applying a fungicide. As the weather warms and dries, red thread and pink patch will gradually disappear.